Prince William could find himself chasing Caribbean drug smugglers on an attachment with the Royal Navy which starts on Monday. The two-month secondment includes five weeks with HMS Iron Duke, based in the West Indies, and time with the Royal Marines and Fleet Air Arm. It is part of the prince's preparation as a future head of the armed forces. William, an army officer with the Household Cavalry's Blues and Royals, served with the RAF earlier this year. Before he takes to the waves, the prince will spend three weeks at the Britannia Royal Naval College in Dartmouth learning basic skills such as navigation, boat handling and sea safety. Afterwards, William will spend several days with the Royal Marines learning about amphibious combat and survival techniques. He is then expected to take part in war games exercises on board a nuclear submarine and a minesweeper before he joins the Iron Duke in late June. The frigate patrols waters around British overseas territories in the Caribbean, and is involved in operations to catch drug smugglers. Rear Admiral Robert Cooling, Assistant Chief of Naval Staff, said the prince could be involved in boarding and searching other vessels during his time on board. William, 25, will share a four-berth cabin aboard the vessel and be woken at 0630 every morning. 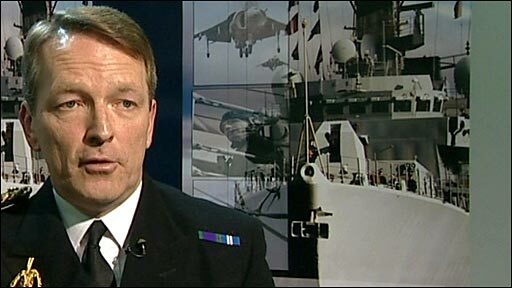 Rear Admiral Cooling said he would not be treated any different to other personnel. "If we treated him like some super VIP and tailored a programme for him and walked around on egg shells, then that would be difficult," he said. "But he's not, he's going to come just like any other young officer and do all the things that young officers get involved in." He added: "As far as the training goes, it's very rigorous - because we don't have passengers out in warships for obvious reasons and he will need to be able to pull his weight in an emergency." 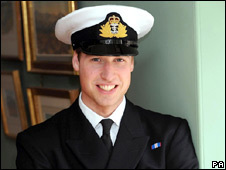 William's father the Prince of Wales, his uncle the Duke of York, and grandfather the Duke of Edinburgh have all served in the Royal Navy. Commander William Entwisle, who has been liaising with Clarence House about the attachment, said: "I went to visit him [Prince William] with the First Sea Lord [Admiral Sir Jonathon Band] about three weeks ago and he's enormously looking forward to the attachment. "Very positive about it, as you would expect."